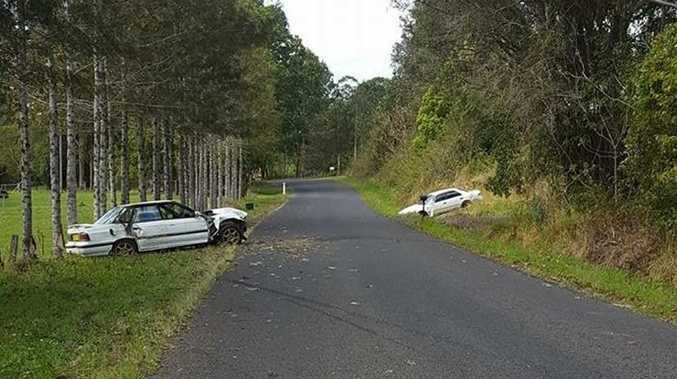 Two cars written off in the space of four days on Stony Chute Road. 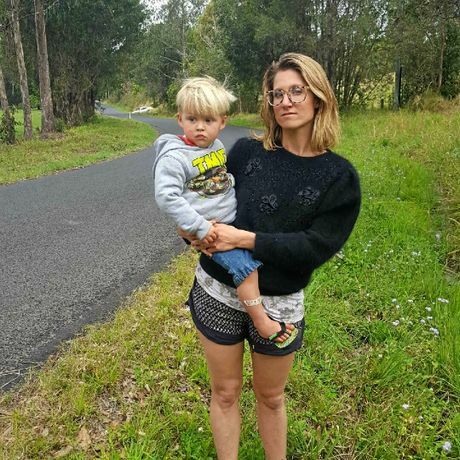 WITHIN four days, two young drivers in unregistered vehicles careened off Stony Chute Rd near Nimbin and abandoned their wrecked cars near the driveway of mother-of-two Pheobe Torzillo. She said both drivers were overtaking on the bend when they lost control of their cars. 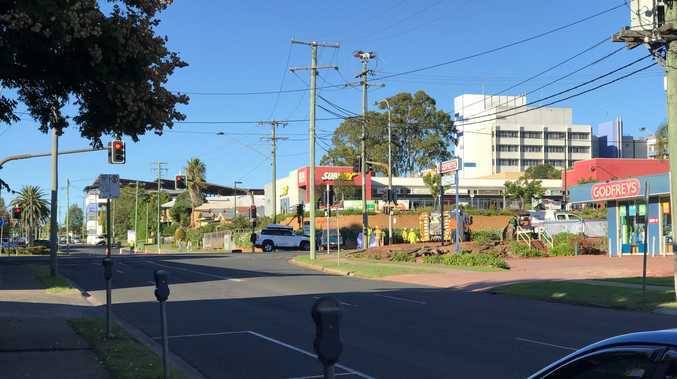 After the first collision last Thursday, Ms Torzillo's partner David Harris witnessed a young man climb out of his wrecked car and proudly skite "I wasn't even wearing a seatbelt", before fleeing the scene. DESTROYED: Cars abandoned on Stony Chute Rd by young drivers who crashed them while overtaking on a corner. Pheobe Torzillo with son Romulus, 2, near the deadly bend on Stony Chute Road. On Monday, a second vehicle lost control at the same spot. 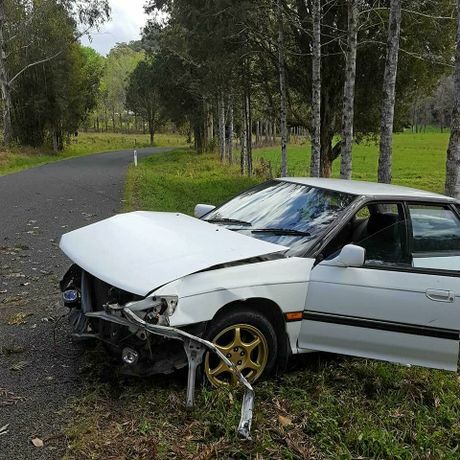 According to Ms Torzillo, the young, self-declared unlicensed driver also abandoned his car and took the number plates. The couple said it was the eighth major collision they had witnessed during their four years on their rural property. They said the drivers were more concerned with making a quick getaway and evading police than anything else. Ms Torzillo said: "He (the latest driver) was trying to leave as quickly as possible. The people he was overtaking convinced him to push the car off the road. Then he took off." But rather than calling for the hoons to be punished with the full force of the law, Ms Torzillo said: "I want them to come over and meet my kids and make the connection between their actions and the people that they are affecting." WRITE OFF: Unregistered car abandoned on Stony Chute Road after a young driver crashed it while overtaking on a corner. Ms Torzillo, who has two preschool-aged boys, has already confronted one of the drivers but believes more needs to be done to ensure the safety of her family and the wider community. "It's really dangerous. It's mostly due to dangerous driving but it must be something about the road as well," she said. "There really needs to be some lines or markers. I would like to see council investigate ways to make the road safer. "I'm appealing to people who know these kids, to talk some sense into them. I don't know if a run-in with the police is going to work. They are already driving unregistered cars and driving without a licence, so I don't think that pathway is going to bring them around." Until something is done the couple fear for their family every time they pull out of their driveway. "We have to slow down right at that corner to turn into our drive so we're in danger every day on that stretch of road," Ms Torzillo said. The first wrecked car still has not been removed from near their house.